Ingots are long primary semi-products obtained through the continuous casting mould solidification. The ingots are used in subsequent forging processes. They are also used in the direct manufacturing of forged hot-rolled rings. 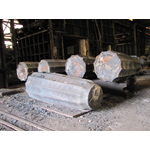 Steel ingots with carbon of over 0.40% and those that are averagely annealed or very highly annealed (particularly those containing Ni) should have controlled cooling, normalization or stress relief annealing applied. As a standard surface, raw casting. It may be possible to consider partial or total heating or shot blasting treatments, upon consultation.